Sizzlin' Hot and Super Cool! 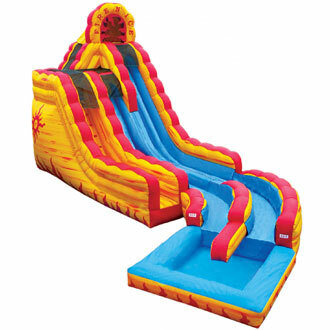 Description: Check out one of our newest slides the Fire and Ice wet/dry slide. This slide can be used as a dry slide or as a water slide with the landing pool attachment. The fire and ice slide is 20ft high and has two slides that participants can slide from, one being higher than the other. Remember to choose the landing pool when planning to use this as a water slide.